Billets and ingots of metal are heated to high temperatures before further processes like hot rolling and hot forging. Scaling / oxidation and decarburisation occur on these billets and ingots during heating at high temperatures. Between 1.5% up to 5% of metal is lost due to scaling at high temperatures. Apart from material loss, scaling causes a number of issues like bad surface finish due to pit marks, reduced forging die life due to impact of hard scale on die during closed die forging, and mill skid situation in hot rolling. Scales fallen in furnace damage the hearth of the furnace and also the induction heater refractory and coils. Removal of scale from the plant is an unproductive, labour intensive work. Decarburisation occuring at high temperatures leaves the metal unfit for making critical components like rails, sensitive automotive parts like leaf-springs, etc., where decarburisation needs to be maintained as low as possible.After forming, the forged, cast or rolled components need to be heat-treated. During heat treatment, scaling causes problems of pit marks, poor surface finish, non-uniform heating and increased shot-blasting / acid pickling time due to heavy scaling.Use of ESPON anti-scale protective coatings manufactured by Steel Plant Specialities LLP ensures that scaling is prevented or substantially reduced. During hot rolling of expensive grades of steel such as stainless steel and alloy steels, a 50% reduction in total scale loss on ingots or billets is ensured. This leads to substantial savings due to increased yield. Decarburisation level can be consistently controlled in hot rolling and hot forging. During heat treatment, ESPON protective anti-scale coatings have often achieved zero scaling. However, results vary depending on various factors. Substantially reduced scaling during heat treatment leads to improved surface finish, reduced shot blasting time, reduced rejections and reduced quench cracking. ESPON-SR Anti Scale Compound is a protective coating that prevents or reduces scaling and de-carburization during heat treatment process. This anti-scale protective coating is suitable to be used in different heat treatment processes including tempering, annealing, normalizing and hardening. ESPON-SR anti-scale protective coating can be applied by brushing, spraying or dipping. Especially in operations like re-heat-treatment of fully machined parts, where there is no allowance for scaling, ESPON-SR has proven to achieve scale-free heat treatment. Use of ESPON-SR Anti Scale Coating also ensures superior surface finish of heat treated components. ESPON-SR is non-flammable and non-hazardous. ESPON-SR can be used to protect fully machined parts during re-heat-treatment. It helps in preventing component rejection due to pit marks formed by scaling. ESPON-SR can be used in heat treatment operations ranging up to 1000 deg. 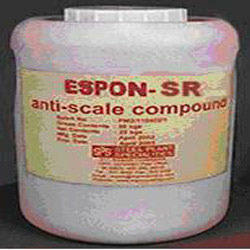 C.
ESPON-SR anti scale compound can be easily removed post heat treatment process. ESPON-SR is especially useful in operations where coating needs to be removed easily and further processes like shot-blasting or grinding are not possible. Packing 10 kgs. / 20 kgs. / 50 kgs. special HDPE container. Description Light yellow paste free from visible extraneous matter. Weight per litre 1.4 kgs ± 0.1 kg. Flash Point Nil. Does not catch fire. Safety Non hazardous. Non flammable. Non toxic during storage or use. Shelf Life 12 months in factory sealed condition. 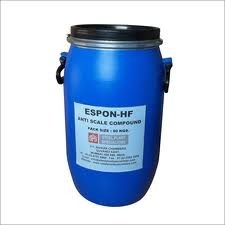 ESPON-HF Anti Scale Compound is a protective coating that prevents or reduces scaling and de-carburization during heat treatment process. This anti-scale protective coating is suitable to be used in different heat treatment processes including tempering, annealing, normalizing and hardening. ESPON-HF anti-scale protective coating can be applied by brushing, spraying or dipping. Use of ESPON-HF Anti Scale Protective Coating ensures superior surface finish of heat treated components. This coating can not be removed manually after heat treatment. It gets removed during shot-blasting or machining operations after heat treatment. 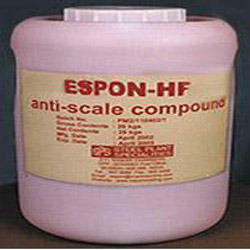 ESPON-HF is non-flammable and non-hazardous. Product helps in substantially reducing post heat treatment processes like shot blasting, grinding and acid pickling. Helps in avoiding component rejection due to pit marks formed by scaling during heat treatment. Helps in preventing occurrence of quench cracks on components during polymer quenching. Use of ESPON-HF ensures superior surface finish of heat treated components. ESPON-HF can be used in heat treatment operations ranging up to 1150 deg. C.
ESPON-HR Anti Scale Compound is a protective coating that substantially reduces scaling and de-carburization on billets and ingots during heating prior to hot rolling and hot forging. ESPON-HR anti-scale protective coating can be applied by brushing, spraying or dipping. Use of ESPON-HR Anti Scale Protective Coating ensures better surface finish of hot rolled or hot forged components. This coating has no impact on heating time or temperature of billets or ingots. Coating gets removed during hot rolling or hot forging operations. ESPON-HR is non-flammable and non-hazardous. Substantially reduces scaling and de-carburization on billets and ingots during heating prior to hot rolling or hot forging. Enables better surface finish of hot forged or hot rolled parts. Helps in avoiding component rejection due to pit marks formed by scaling. ESPON-HR can be used to protect billets or ingots at high temperatures up to 1280 deg. C.
Looking for Anti Scale Compounds ?